Fort Nephi (1851-1872) - A Mormon settler Fort established in 1851 before the Walker Indian War (1854-1855). Located in present day Nephi, Juab County, Utah. Probably abandoned as a fortification after the end of the Ute Black Hawk War in 1872. Also known as Salt Creek Fort. 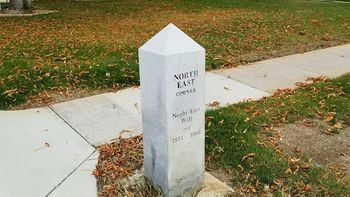 Fort Nephi Northeast Corner Marker. 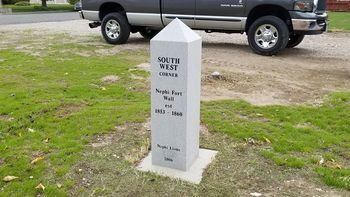 Fort Nephi Southwest Corner Marker. Established in 1851 at the request of Brigham Young. The new Fort was built in the center of town to protect it against hostile Indian attacks during the Walker Indian War (1853-1854) era. The Fort was built as a protective wall surrounding a nine-block area in the center of town. The wall was built of gravel, mud and straw, was 12 feet high, 6 feet wide at the bottom, 2.5 feet wide at the top and 420 rods in length. Gates were provided in the north and the south walls. The original marker is missing from it's reported location in a city park but at least three of the fort corner markers were located. Location: Nephi, Juab County, Utah. Roberts, Robert B., Encyclopedia of Historic Forts: The Military, Pioneer, and Trading Posts of the United States, Macmillan, New York, 1988, 10th printing, ISBN 0-02-926880-X, page 792.